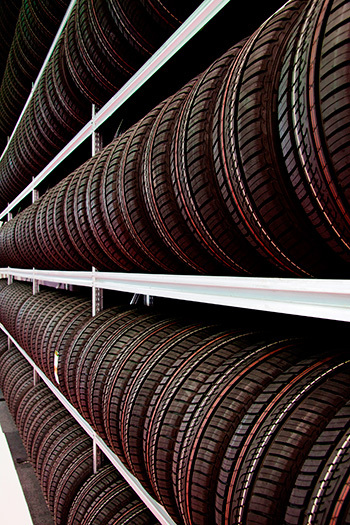 With our inventory of 15,000 tires, Garage A. Prieur & D. Brunette can handle both large-scale and individual sales. We stock tires to meet all needs and every type of vehicle, from family cars to performance vehicles, vans, trailers, ATVs and more. Tires have a significant impact on your driving and the condition of your vehicle. Depending on your driving style, vehicle use, desired performance and season, Our Pneu Select’ experts will know what is right for your vehicle and will advise you on tire purchases, repairs or winter/summer changeovers. When you’re purchasing tires, bring your business to Garage A. Prieur & D. Brunette. Our distribution centre will be able to supply you, whether you live in the Vaudreuil-Dorion area or Montreal. To learn about the wide selection of tire brands stocked by Garage A. & Prieur D. Brunette, click here. In general, the front tires tend to deteriorate faster than the rear tires because of their position and the weight of the vehicle engine. To avoid uneven wear on your tires, it’s advisable to change their position every 8,000 or 12,000 km, depending on the recommendation in your vehicle manual. To increase tire life, Garage A. Prieur & D. Brunette provides a tire rotation service. In addition, with the purchase of four tires, Garage AD provides free tire rotation every 8,000 kilometres. This service is offered free of charge during maintenance inspections. Over time, tires lose pressure, which has a negative impact on vehicle performance. For those who don’t remember to check their tire pressure every month, Garage A. Prieur & D. Brunette provides nitrogen inflation. Nitrogen offers many advantages. Tire pressure is maintained longer because nitrogen molecules are larger than air molecules and therefore take longer to escape from the tire. Nitrogen reduces rolling temperature, does not damage the interior of the tire and prevents rim corrosion. Better tire pressure can also have a positive impact on your gas mileage. Depending on weather conditions and type of road (rural, mountain, etc.) most frequently encountered, you may need to install studs on your snow tires to increase tire traction. To learn about the range of tires that can be fitted with studs or tires that are studded during manufacturing, don’t hesitate to ask for assistance from the consultants at Garage A. Prieur & D. Brunette. We have a very large inventory at our distribution centre. At Garage AD, your tires will be safely stored in optimum conditions at our centre. In addition, we monitor the rate of wear. When you entrust us with your summer or winter tires, you avoid having to find storage space and don’t need to transport them for installation. And of course, you won’t dirty your vehicle. You also get insurance protection. Learn more about our service from a consultant at Garage A. Prieur & D. Brunette Inc. and enjoy its benefits immediately!